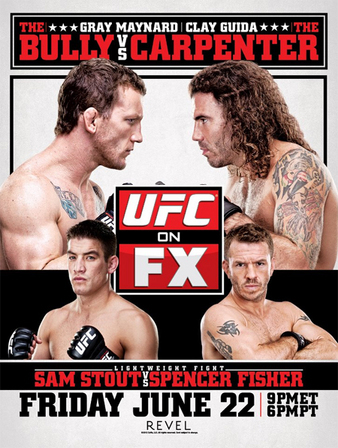 UFC officials announced the bonus winners for UFC on FX 4 shortly after the event. Cub Swanson, Dan Miller, Sam Stout, and Spencer Fisher all took home $50,000 in bonus money for their performances. Cub Swanson picked up “Knockout of the Night” with Dan Miller receiving the “Submission of the Night”, and Sam Stout and Spencer Fisher earned “Fight of the Night” honors. The event took place at The Revel Casino in Atlantic City, New Jersey, with a reported attendance of 4,652. The main event featured a matchup between Gray Maynard and Clay Guida in which many fans and media felt the fight lacked excitement due to Guida’s game plan to seemingly avoid dangerous encounters, resulting in a drawn out game of cat and mouse. Cub Swanson picked up an impressive upset victory over British fighter Ross Pearson. The two men were involved in an exchange of kicks and punches during the first round. It was much of the same in the second round until Swanson landed a stiff left hand to Pearson’s chin that dropped him, and after a few follow up punches the referee called a stop to the action. Dan Miller took on Ricardo Funch in a bout that went to the third round with the fight ending up going to the ground and Miller securing a guillotine choke. The nights co-main event between Sam Stout and Spencer Fisher was third fight between the two, and also a similar pattern of the first two fights. Stout managed to maintain control throughout most of the fight and score some takedowns off nice transitions that secured the victory.